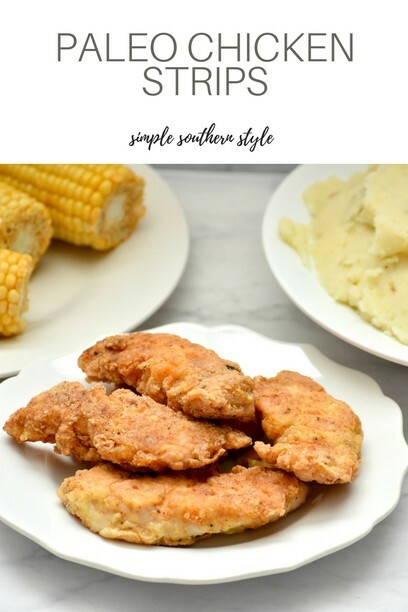 Paleo Chicken Strips that are simple but still southern style. ALL OF THE GLUTEN FREE GOODNESS! When you have kids Gluten Free Chicken Strips are a must and I have been making them for years, but never did a recipe on the blog for it. 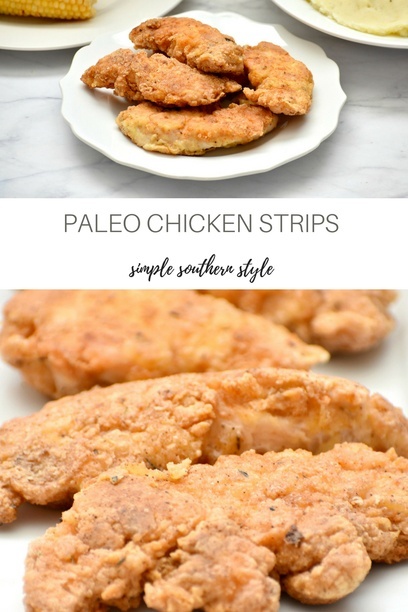 So, when I decided to actually write down my recipe I wanted to do a Paleo Chicken Strips recipe for several reasons. We try to avoid grains when possible. And when I say “we”, I really mean me. The rest of my family could care less about avoiding grains, but that’s because they have zero worries about food and I worry plenty for all of us. Paleo allows you to eliminate many allergens and makes this a friendly recipe for many. This does contains eggs, however you could skip the eggs, but you will not have the crispy batter on the outside like we desire in a chicken strip. A Paleo diet is great when your body needs a reset and this is true comfort food in all its glory. I did however, serve this with corn on the cob, but any roasted root vegetable such as my Oven Roasted Carrots would go absolutely perfect with this dish. It was also served with mashed potatoes, but a mashed cauliflower would be lovely too. 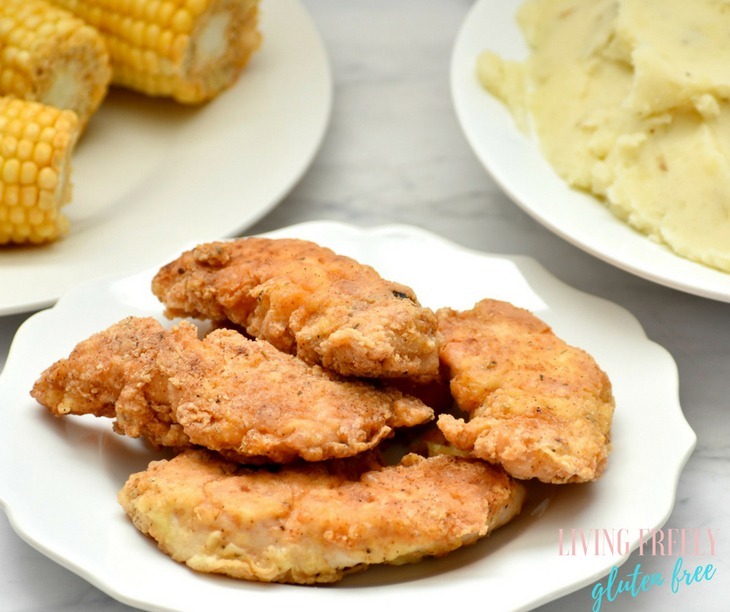 I’m all about healthy dinners that please the entire family and that is exactly what this Paleo Chicken Strip recipe provides. Everyone sat down happily and finished their plates with ZERO complaints and that just doesn’t happen often these days. 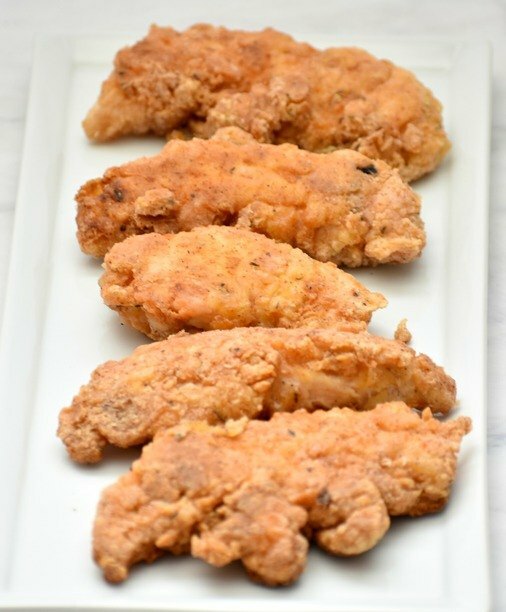 How do I make these Paleo Chicken Strips? It is actually very simple. You will start with 3 shallow bowls. Then you will add the starch in one, Almond Flour in the other, and beaten eggs in the last one. Go ahead and add your spices and seasonings to the starch. Line a plate with paper towels and remove your chicken from the package. With tongs place the chicken on the paper towels. You can buy pre-cut chicken that is already cut into tenders and I prefer this, if not then you will need to cut the chicken to your desired size. You will now need to heat your oil. I always fry with coconut oil because it is made to cook at high heat. A lot of oils can release toxins when they reach high temperatures, so always keep that in mind. The rule of thumb for oil temperature is around 350 degrees F.
While the oil is heating you can begin to coat the chicken strips. Start with the Almond Flour, then the eggs, and finish with the starch. Place the strips in the hot oil and cook on each side for about 4 minutes. Place the strips on a new clean plate that is lined with paper towels to drain off some of the oil. Pro-tip: Turn your vent hood on and you might need to switch your oil out half way through. It can get smokey if you have the heat up too high. Once your oil heats to 350 you can turn the heat down to medium low. Paleo means that it is free of grains, dairy, sugar, legumes, harmful oils and sugar. It is a great way to make sure that you are eating lots of healthy proteins and fats. 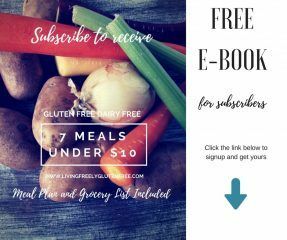 Since paleo is free of gluten and dairy it is a great option. Enjoy! The perfect way to enjoy your favorite comfort food with zero guilt. In 3 shallow bowls separate the almond flour, eggs, and starch. Add the salt, granulated garlic, paprika, pepper, rosemary, and thyme to the starch and whisk to distribute the seasonings evenly. Place your chicken tenders on a plate lined with paper towels. Heat 1/2 Cup of the Coconut Oil in a pan. About 350 degrees is your ideal temperature. Dip your chicken tenders in this order: Almond Flour, Eggs, Starch. Repeat each tender. Place the tenders covered in batter in the hot oil and cook for 4 minutes on each side. Repeat until they are all done. Halfway through you will likely need to replace the oil with the remaining 1/2 cup. If the oil darkens too much then use a new pan with the new oil. Make a new plate lined with paper towels and set each cooked chicken strip on it to allow it the oil to drain. Serve with your favorite sides and enjoy! Subscribe to start living freely! Sign-up now - start living freely!